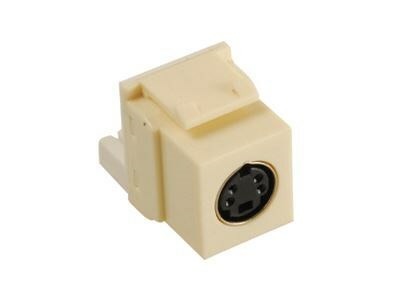 This high performance S-VHS video connector provides a clean connection point for wired electronics to wall outlets allowing cables to be hidden within the walls or cabinetry and is fully compatible with all ICC's modular faceplates and multi-media panels. Allows video transfer over UTP cable. Compatible with all IC107 faceplates, inserts, surface mount boxes, and blank patch panels. Housing color available in almond, black, ivory, and white.